Kids are constantly on the move. As a parent/guardian, you always want them to keep an open mind and try new things, whether it be a new food or sport. By exposing them to new things, their horizons open and they’re more likely to find their true passion. Have you considered signing them up for a bowling league? Fall leagues are now forming making it a perfect time to try competitive bowling! 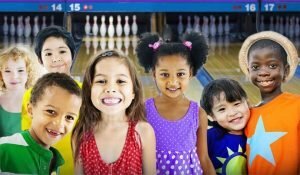 Not sure if bowling leagues are a good fit for your kids? field so everyone competes at their appropriate level. Make new friends – It’s a great way to meet people outside of their normal social circle and get the opportunity to make new friends. There’s also the added bonus of having to take a break from staring at a screen to be present and in the moment. Physical activity – It gets the kids up and moving whether it’s bowling your turn or cheering on your teammates. It’s a great way to burn calories and build strength and endurance without even knowing it. Promotes teamwork and sportsmanship – Bowling leagues are a great opportunity to learn teamwork and proper sportsmanship. They learn the importance of building each other up as well as losing graciously. Bowling is fun – They’ll learn a sport that they can play at any stage in life. It’s a skill they can share with friends and pass on to the next generation. If you think this sounds like a good fit for your kids, check out our Leagues Now Forming Page. There’s a link at the bottom of the page to easily sign up for the league of your choice. Should you have any questions, contact our League Coordinator at 248-437-0700 for more information.